2017 was my second year doing the Rainbow Scrap Challenge hosted by Angela of So Scrappy. 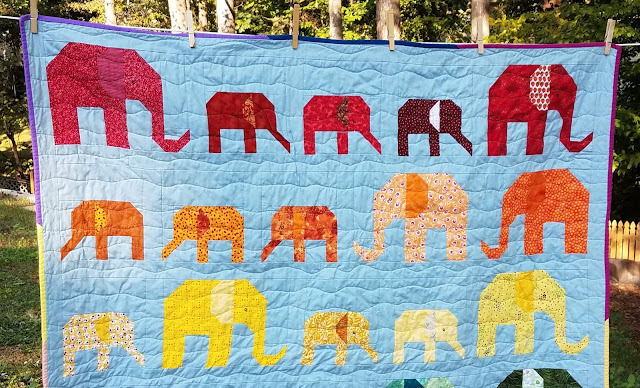 I picked Elephant Parade, a pattern by Lorna of Sew Fresh Quilts that she did as a quilt along, and she keeps her quilt along patterns up and available. For each color, I made 2 adult elephants and 3 baby elephants. The backing fabric is Kona Fog. The elephants are from scraps, obviously. Each month, I alternated the direction I made the elephants. This means that went put in rainbow order, it ended up much more random, but I'm okay with that. If you are wondering why there are 4 rows facing left and only two rows facing right, there was originally a pink row as well. But I felt it made the quilt too long, so I turned the pink elephants into their own project called Elephants in the Garden, finished earlier this year. This is a baby gift for two of my wonderful friends from college who just had their second baby, a lovely young lady named Cassandra. The back is a Lucy Cousins print that I bought years ago. (Lucy Cousins is a children's author & illustrator, she writes the Maisy books.) I had to piece a bit as I was just a little short. I am sorry now that I used the drab pale yellow fabric and didn't look for something brighter; that pale bit in the upper corner looks so out of place. 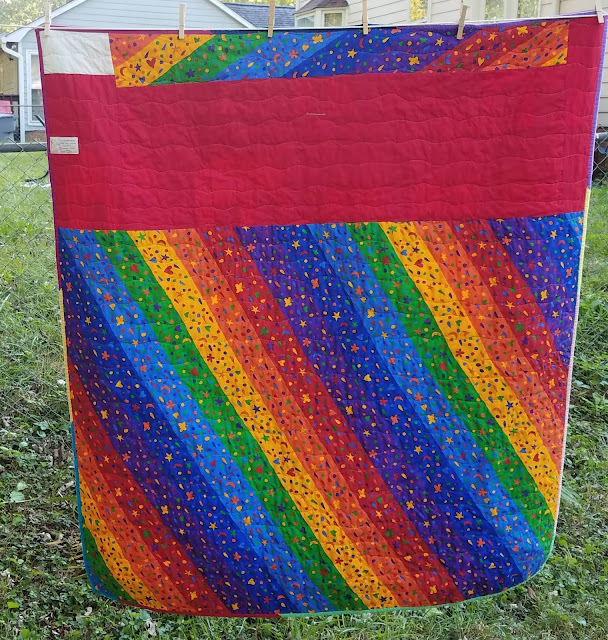 I do love the rainbow back for a rainbow quilt! This is #4 on my list of Q4 goals for the globally-hosted Finish Along. It's on also on the list of projects that qualify for my PhD (Projects Half Done) with Gail of Quilting Gail. I'll also be linking up with Tish's Adventures in Wonderland during her next UFO linky party. That is just adorable! Congratulations on a wonderful finish! And, what a lovely rainbow elephant parade! I see you already have a label, but the light patch would be perfect for a label and now one would every know! Both are so cute! Such a cute parade of elephants, and I love that backing! I like Paige's idea of a label on that light piece. I'm sure they will enjoy this quilt for years to come. Love those scrappy elephants in their rainbow order...and I also really love the diagonal rainbow. I do love bright. 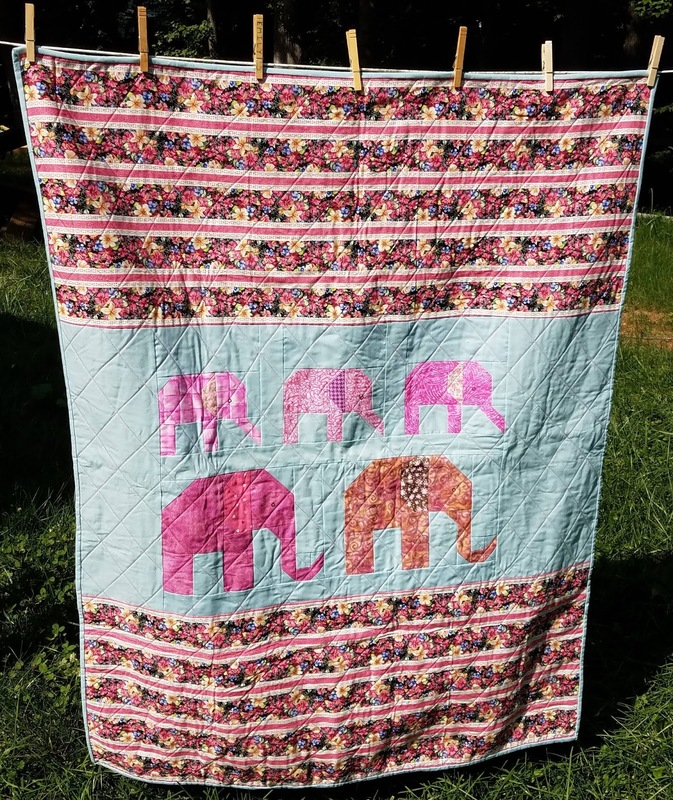 Both of your elephant quilts are adorable! That was a great choice for the Rainbow Scrap Challenge. Those elephants are sew cute! Some child will be so excited when they see them all prancing around on their quilt. I love this! What a beautiful quilt! Your rainbow elephants are so adorable! A lovely finish. LOVE your Elephant Parade Quilt!! Front AND back! I also like the random placement and greatly appreciate the rainbow-order row arrangement. Nicely done!! 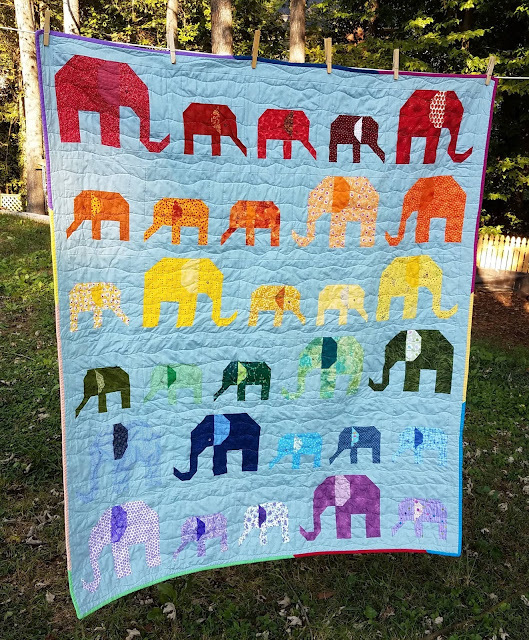 I am in love with your rainbow line up of pachyderms! What a gorgeous finish!!! A very fun RSC project! Congrats on a beautiful and colorful finish. So cute! I think that the only thing better than elephants is rainbow elephants! This is adorable! I love how each little elephant is unique. I'm sure she will love it and spend lots of time cuddling her new baby with it. This looks really awesome! 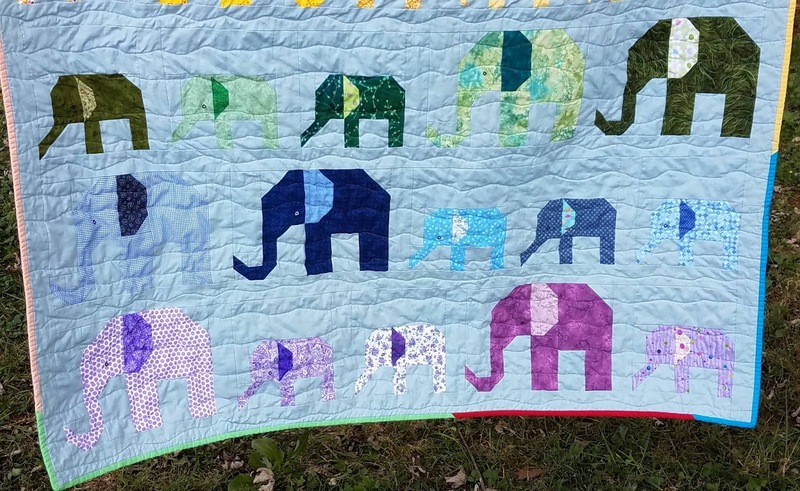 I love that you used random scraps to make all the elephants. Scraps and rainbows are my favourite! Such cute elephants! I think making them in a rainbow pattern was a perfect idea. How cute! 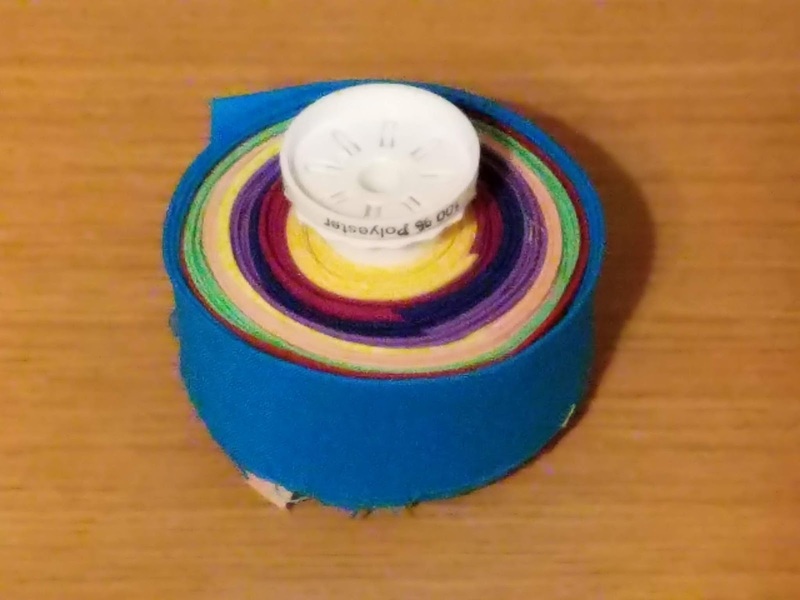 And I love your spool binding idea. I may have to try that! Such a cute baby quilt! 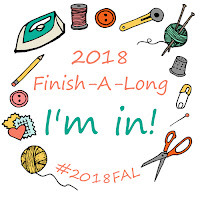 On behalf of the entire FAL crew, congrats on your finish!